The City, Not Long After, is a charming, witty and most importantly, witty exploration of conflict. As I noted, there are some elements that may annoy some readers, but if you can tolerate them, this novel is well worth your time. Thoroughly enjoyable. 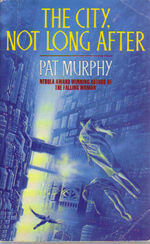 This entry was posted in Review and tagged novel, sf, sf mistressworks. Bookmark the permalink. Ah this is one of my favourite books. It sits interestingly alongside Lisa Goldstein’s slightly less spectacular A Mask For The General as convincing, charming advocates of non-violent conflict resolution in SF. Parts of Tricia Sullivan’s Clarke-nominated Lightborn reminded me of Murphy too. SE FOR TUDO DE GRAÃ‡A; GOSTARIA DE RECEBER EM CASA: LIVROS RELIGIOSOS, DVD SOBRE CAIXAS DE SOM, DVD SOBRE JANELAS E PORTAS, DVD E LIVRO QUE EU NÃƒO FAÃ‡O NEM IDÃ‰IA.